And A Meal to Be Won! A fantastic refurbishment and new management team is putting this former Syon House estate 18th century coaching inn back on the Isleworth map. Just minutes from the Waldorf Astoria hotel and situated on London Road, a once-busy route to the West Country, the Coach & Horses is famed for its literary appearance in Dickens’ Oliver Twist. Bill Sikes and Oliver stopped en route to Chertsey and no doubt whet their whistles with a pint or two whilst their horses rested. Although you won't find any horses there today, the Coach & Horses still retains much of its old world charm keeping original features including traditional glass plating, 'saloon bar' glass signage in the bar, and former sketches and photography of the local area evoking Dickensian London. The room, which once housed the stables, has now been revitalised into a library dining space complete with bookcases, an array of antique mirrors and 'grandma style' lampshades scattered throughout. 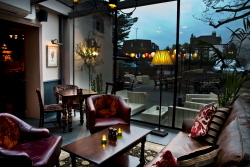 Bringing the outside in, the atrium is ideal for couples or small groups, while outside, the large patio terrace complete with tables and parasols acts as a fabulous suntrap in the summer months and is heated for chillier occasions. Landlady and trained chef Karen Paxton has fashioned a deliciously-British menu that will tempt and delight from morning ‘till night. Focusing on well-sourced fare, start with smoked salmon, crayfish and avocado salad; or chicken liver and pork pate with spicy tomato chutney. Hearty mains include the Coach & Horses handmade West Country beef burger with Lincolnshire Poacher and smoked bacon; 21 day matured ribeye or fillet steak served with hand cut chips; and a delicious butternut squash with rosemary risotto. The Coach & Horses takes its desserts seriously. Favourites like white chocolate, orange bread and butter pudding with vanilla sauce; bitter chocolate torte, raspberry coulis and raspberry ripple ice cream, or lemon tart with homemade lemon sorbet will tempt diners into indulgence. All puddings are handmade and ice creams are made from scratch in the kitchen. At weekends, diners can relax with the papers and enjoy brunch classics like eggs Florentine, Benedict and Royale; healthier options including granola with honey and yogurt; and fresh toasted bread served with preserves and butter; or for heartier appetites the English or vegetarian breakfast come with all the works. Little ones have their own British-sourced dishes too. At just £6, they can choose from options including sausage, mash and seasonal vegetables; or tomato and parmesan tagliatelle and take their pick from homemade vanilla, raspberry ripple ice cream or lemon sorbet for afters. Weary travellers will be welcomed at the bar, which offers a large range of traditional Young’s cask ales as well as changing local guest beers available on tap. The international wine list is split into helpful sections like ‘dry, fresh and zingy’, ‘aromatic and exotic’, and ‘fuller flavoured and rounded’, and many bins are available by the glass. If you’re looking for nibbles with your ale, make sure you tuck into the range of tasty bar snacks including homemade pork scratchings, honey and mustard coated mini sausages, and scampi with tartare sauce, all served up in traditional half pint jugs. If you're a registered member of BrentfordTW8 and would like to win a three course meal for two with coffee, soft drinks and a bottle of house wine to share then please email editor@brentfordtw8.com. A winner will be drawn at random on 26th May.